For Sweet Potato Patties: preheat oven to 400ºF. 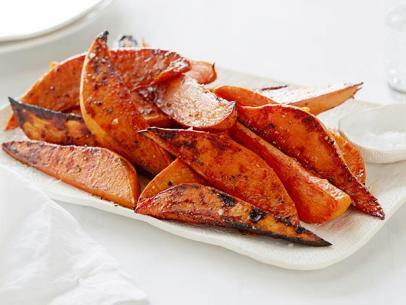 In a large bowl, toss sweet potatoes and garlic with olive oil and season with Kosher salt and freshly ground black pepper. Place on baking sheet and roast for 35-45 minutes or until tender. Remove from the oven and allow to cool slightly. In the bowl of a food processor pulse to combine sweet potato, Worcestershire, onion, and chickpeas. Remove mixture to a large bowl and add the rolled oats and cashews and mix to combine. Form into five patties. In a large sauté pan add the coconut oil and heat over medium-high heat. Add patties and cook until golden brown, about 4 minutes, flip and cook another 4 minutes. Remove and keep warm. To Serve: place buns on a sheet tray and place in the oven. Toast until golden brown, about 4 minutes. On the bottom of the bun place burger patty. Top with avocado, pickled onions and green lettuce. Spread mayonnaise and Dijon mustard on top bun and place on top of the burger. Tip: use a plastic lid and plastic wrap to help form the burger patties into perfect rounds. In a large Dutch oven or heavy-bottomed skillet, heat 1/8-inch vegetable oil over medium high heat until shimmering (but not smoking). Note: oil should sizzle when you drop a few shreds of sweet potato in. 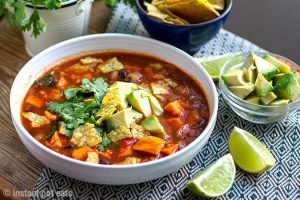 Using a cheese grater, coarsely grate sweet potato and place in a large bowl. Pour lightly beaten eggs into shredded sweet potato and stir together. Add parmesan cheese, brown sugar and onion powder, and season everything liberally with salt and pepper. 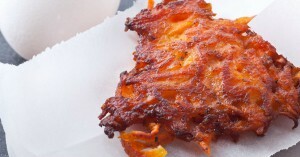 Mix until everything is incorporated and sweet potato is thoroughly coated. Working in large spoonfuls, drop sweet potato mixture in large clumps into the hot oil. Using the back of a spatula, pat sweet potato rounds down into a flat disc. Cook undisturbed for 2-3 minute, or until golden brown. Flip and cook other side until golden. Preheat the oven to 375 degrees. Lightly grease eight 8-ounce ramekins or the baking dishes of your choice (see headnote) with a little oil and set on a baking sheet. Heat 1/4 cup of the oil in a large, heavy pot over medium heat. Add the shallots and cook, stirring frequently, until translucent, 2 to 3 minutes. Add the leeks and all but 1 teaspoon of the thyme to the pot and cook for another 2 minutes, until the leeks are tender. Add the garlic and tomato paste and cook until the garlic is fragrant, about 30 seconds. Add the chopped mushrooms to the pot all at once. Cook until the mushrooms are collapsed, tender and glistening, about 8 to 10 minutes, stirring often. Sprinkle the flour over the mushrooms, stir and cook for about a minute, until the flour no longer tastes raw. Pour the stout into the pot, scraping up any browned bits at the bottom of the pan. Add the vinegar and tamari. Bring the mixture to a boil, then reduce the heat until the mixture is gently bubbling and cook until the liquid is reduced and as thick as gravy, 5 to 10 minutes. Remove from the heat. Stir in the olives and chopped parsley. Season the mixture lightly with salt and pepper. Divide the mushroom mixture among the ramekins. Layer the sweet potato slices on top, overlapping the rounds as you go, until there are 2 solid layers of sweet potatoes on each dish. Brush the sweet potatoes with the remaining 2 tablespoons of oil, and sprinkle equally with the 1/2 teaspoon of salt, the 1 teaspoon of pepper and the remaining chopped thyme. 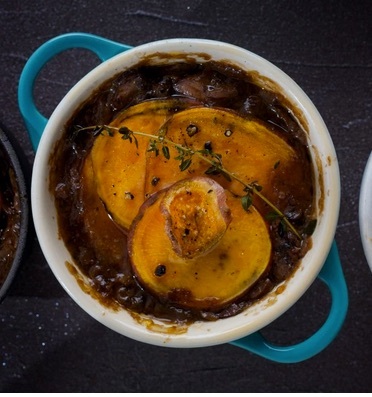 Toss sweet potato with 1 tbsp of the oil; spread on lightly greased rimmed baking sheet. Roast in 400F (200C) oven, turning occasionally, until tender and golden, about 20 minutes. In bowl, whisk together remaining oil, lime juice, honey, salt and pepper. 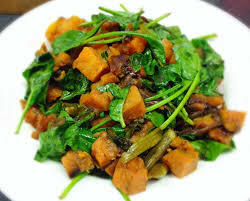 Stir in sweet potato and spinach.